The halls are decked and the presents are under the tree. It is a holiday card in the making, except for one small thing. 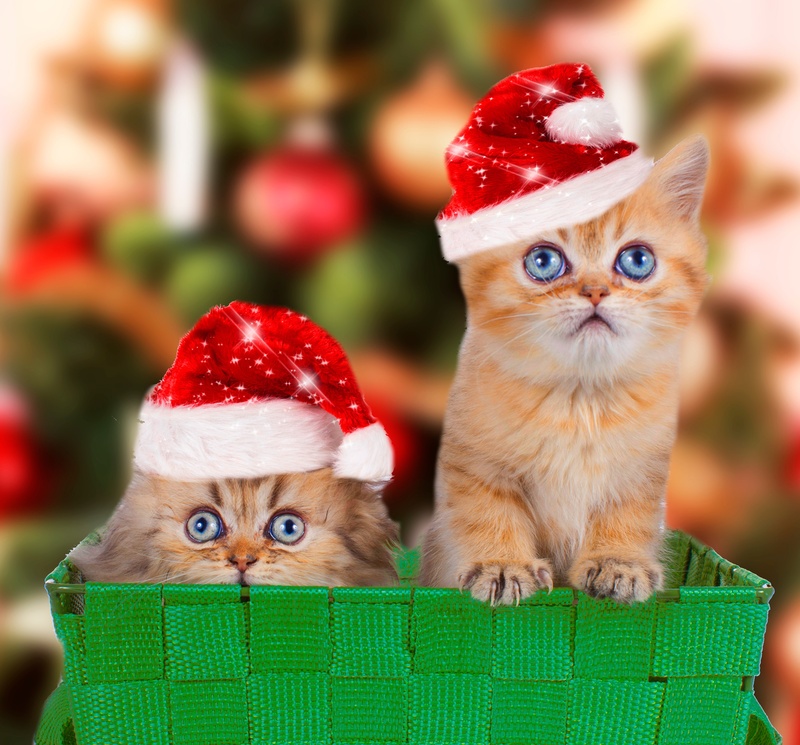 You may not have realized that those beautiful gifts under the tree might be a hazard for your household pets. If you have animals in the home this holiday season, take a moment to learn about gift wrapping safety. A few extra precautions could mean the difference between a picture perfect Christmas and a not-so-merry one at the emergency room. Pets are often very curious about packages and novel things in the home. If you are wrapping gifts early and putting them under the tree, or if you have gifts from others that will be residing there for a bit, try to think about what is in them. Some items are too much for curious noses and can result in harm if ingested. Food items – Certain popular holiday treats like chocolates, fruitcake and other baked goods can contain ingredients that can be harmful to pets. Even things like cheeses and sausages, while not directly toxic, can cause stomach upset or even pancreatitis. Scented gifts – Certain items such as scented soaps, candles, and even tobacco products may not sound tasty to you, but can be irresistible to some pets. Some perfumes and aftershaves can even contain ethanol, which can be toxic if ingested. Pet treats – If you have wrapped up a giant rawhide or a big box of treats for your special someone, don’t expect him or her to have the patience to wait until Christmas. Use some precautions to ensure that your dog or cat doesn’t help him or herself and overdo it. Be sure to ask guests bearing gifts if their packages might contain any items such as the above. If so, be sure to store them out of the reach of your furry friends. Use wrapping paper that does not contain harmful chemicals and do not allow pets to ingest it. When putting out gifts, it is a great practice to just stop and think about whether a particular package might be an unnecessary temptation for your pet. Poisonings, digestive upset, and foreign objects stuck in the intestines are no way to spend your holiday season. Practice a little common sense and keep your whole family, pets included, safe this year. Happy holidays from us at VitusVet!